Another hockey season has arrived. It’s time to see who spent the summer improving their skills and who spent it sitting on the couch playing Super Mario Brothers. If you fall into the latter category, there’s still hope. 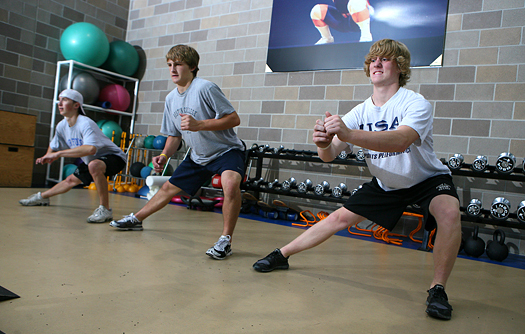 USA Hockey Magazine asked the fitness experts from the National Strength & Conditioning Association for advice that will help every hockey player improve all aspects of his or her game in four weeks time. Not that you’ll be the player you want to be after four short weeks, but if you follow this advice, you’ll be well on your way to becoming a better player. Hockey is about rest and recovery, so the training routine should be more like a sprinter than a marathon runner. Instead of running long distances, your workout should consist of short interval training, like running shuttles or suicides. You also need to incorporate the right amount of rest between intervals. If you run a suicide for a minute, then give yourself two minutes to rest so your body recognizes that recovery period and can adapt. Getting into hockey shape requires you to maintain the proper balance of working and resting, because you will be spending time resting on the bench between shifts. Did you know that playing video games before bed can actually prevent you from getting a good night’s sleep? It’s true. While video games may be good for hand-eye coordination, they shouldn’t be played before bed because your brain is still racing through Grand Theft Auto and you’re not getting into the right R.E.M. cycle. The shoot ’em up, blow ’em up video games with a lot of screen changes, and even action movies, have the same effect. So the next time you want to play that last level in Halo, remember that even the Colorado College hockey players are not allowed to play video games the night before a game. As a hockey player, your focus should be on speed and explosive movements because you are never going to reach full acceleration — the rink is not big enough. Your first-step quickness is going to be your bread and butter, so work on the short, five- to 10-yard sprints. Diagonal movements are also important because you are pushing off of your skates in a diagonal motion, not pushing straight back like a runner. Building strength is not all about how much weight you can lift. You can be the smallest guy on the team and still be the hardest one to knock off the puck. Resistance is the key to developing strength and power. Being able to pull or push through your own weight will teach your muscles how to compensate for that resistance so that once you step out on the ice, your stride is more powerful and you become a stronger force. Sit-ups and crunches are always going to be a great way to get strong abs, but hockey players should not put so much emphasis on the traditional methods. After all, hockey players play the game on their feet, not lying down. As a hockey player, you also have tighter hip flexors from bending to accelerate or take a face off. So performing standing twists or overhead squats can help loosen up your hip flexors. In order to get the most range of motion from your muscles, two different types of stretches should be used in your workout. Essentially, static stretching is your resting range of motion while dynamic stretching is your active range of motion. Dynamic stretching should be done before a workout in order to get your blood flowing and to prepare your muscles for the work they will be doing. Dynamic stretches are done on the move and go through the muscles’ entire range of motion. Static stretching should be done after a workout when your muscles are warm. Static stretches help maintain flexibility in the muscles. A healthier lifestyle is much more than just eating right. While it is still important to make sure you’re not eating fast food burgers everyday, you also need to make sure you are training right and getting enough sleep. More is best to a certain extent, but taking time off to be just a kid is what most athletes miss out on. For the younger kids, parents need to take an active role in making sure that players are developing good habits at home. There is not much you can control once your kid hits the ice, but at home, you can regulate what your kids eat, how much they train, when they go to sleep and when they need to focus on school. Habits formed now will follow them throughout their playing days. 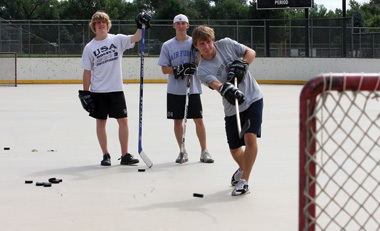 Most players in the past developed hockey sense – the ability to read the ice – by spending countless hours on a local pond or backyard rink. Since those days have pretty much gone the way of the wooden hockey stick, players must find different ways to develop their hockey sense. Getting off the couch and stepping away from the Xbox is a great start. Any opportunity you have to have a stick and a puck (or ball) in your hands is a great start. 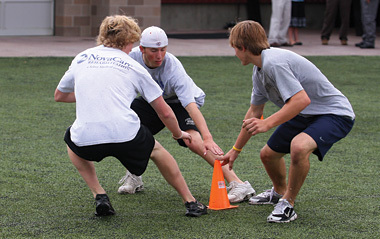 Whether it’s putting together a game of street hockey with friends or playing knee hockey in your basement with your brother, playing without coach or parent interference will allow you to figure things out on your own, and that will then translate to the ice. On the ice, small area games are great training methods because you have to learn to read and react quickly with the puck. And even with the high cost of ice time, coaches should still find time to dump a bunch of pucks in the center of the ice and let players play. Are any of these heart-pumping songs in your iPod? 4. That Was a Crazy Game of Poker by O.A.R. For some athletes, listening to music while working out helps motivate them to reach new heights. Still, you have to be sure that you plug those headphones in at the right times. You should listen to music when you are working out on your own, in a safe environment. Make sure you’re not on the street near traffic or in a gym setting where things can go wrong if you can’t hear someone yell a warning. Try to avoid bringing your iPod to a training session with a strength and conditioning coach. They are there to coach you, not babysit. If you’re tuned into your tunes, you’re probably tuning out your coach. Be careful about what you listen to when you are in a recovery work out, like riding a stationary bike after a game. When the tempo picks up in the song, then your tempo on the bike also picks up, defeating the purpose of a recovery ride. 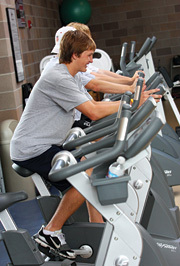 Riding a stationary bike can help aid in recovery and cool down after a game or an intense workout. It gives players that didn’t see a lot of ice time some extra conditioning and it also helps circulation and blood flow slow down so the risk of cramping and tightening decreases. Riding at a slow, easy pace for 10-15 minutes, followed by static stretching is a great cool down. Being a better teammate starts with being the best person you can be. Your talent and skill will only get you so far and that’s when your character will shine through. The higher you climb on the hockey ladder, the more you’ll find that everyone can play the game. Colleges tend to recruit character people, not just good hockey players. Make sure you are the type of person other players and coaches will want to be around. Like everything else in hockey, practice makes perfect. Find a technique that works for you and get outside with a makeshift net and shoot. Repetition will make the motions seem natural, so when you do get on the ice, you won’t have to think about how to take the next shot. The key is repetition, repetition, repetition. It’s also important to practice all types of shots, and from different angles. Joe Sakic of the Colorado Avalanche spends time at every practice shooting from various angles and positions, including off the wrong foot and from his knees, because you are seldom in the perfect position for a shot on goal. Every one, at one point or another, wants a set of washboard abs. However, as hockey players, having six-pack abs means you’re giving up something more important — body fat. In order to have visible abs, your body fat must be very low, but that means that your gas tank is low. You need the body fat to burn as fuel when you are active. Six-pack abs are certainly nice to look at, but you could be sacrificing performance. Students that do well in school tend to do well in athletics. It is not necessarily translated in A’s on a report card, but students that have the ability to apply what they learn often do better in athletics. According to most coaches, if you’ll cut corners in the classroom, you’re likely to cut corners on the ice. Special thanks to Mark Stephenson, Jay Dawes and Greg Infantolino of the National Strength and Conditioning Association for their help with this feature. Check out the NSCA online at nsca-lift.org.